With the Duchess of Sussex due to give birth to her first child at the end of the month, speculation is rife as to what the baby – who will emerge seventh in line to the throne, ahead of its parents – will be named. Diana is by far the favourite among Britain’s bookmakers, with 4/1 odds being set (at time of writing) for the child to be named after Harry’s mother, should she be a girl. 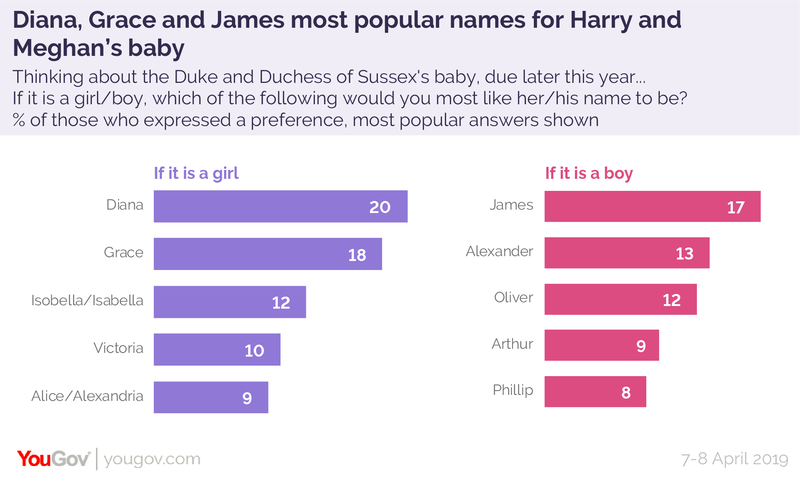 Diana is also the favoured name among the public for the baby, according to a new YouGov Realtime survey, with 20% of those with a view saying this name would be their preference. Grace comes not far behind, on 18%, although the bookies give the name longer odds at 12/1. Bookmakers seem far less sure about name options for a boy. At the much longer odds of 16/1, the two most likely names belong to two former kings: one historical (James) and one mythical (Arthur). The public much prefer James (17% of those with a view) to Arthur, which gains just 9% of the vote, behind Alexander on 13% and Oliver on 12%. YouGov conducted a similar survey back in 2013 ahead of the birth of the Duke and Duchess of Cambridge’s first child, Prince George. The results indicate that the public are somewhat less enraptured by 2019’s impending birth – while in 2013 fewer than half (between 44% and 47%) of Britons had no opinion on the baby name, almost two thirds (between 63% and 65%) say the same this time round.